Chunks past a certain point (multiplayer cache?) fail to load when client render distance is less than server view distance. The only way to work around this is to set the client render distance greater than server view distance, and reconnect. F3+A or just changing the render distance after the fact do not help. There are no errors on the server command line. Join with a vanilla 19w12b client with render distance set to 2. You will seemingly stand on nothing now. Logging out and reconnecting allows you to load the same amount of chunks from this point to any direction. Logs for both client and server are included. Note that all of the "fell out of the world" messages are results of the kill command on server command line, not falling down. I can confirm that the server sends chunks too far away when client render distance is less than the server's, only for the client to discard them, and it won't re-send them when the client would actually need them. both server and client are vanilla 19w11b. [-10, -10] through [10, 10], except for a smaller square in it, [-4, -4] through [4, 4]. Same with walking (along X) to chunk (2, 3, 4, 5); ignoring X (12, 13, 14, 15); discarding X (-3, -2, -1, 0); chunks remaining in cache (63, 54, 45, 36). Blocks in chunk [5, 0] are not rendered (entities are). When stepping over the edge to the seemingly nonexistent chunk [5, 0], the client ignores chunks [15, -10] through [15, 10] and discards [0, -4] through [0, 4] leaving MultiplayerChunkCache 81, 36. 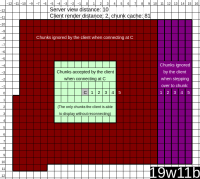 At this point chunks [-3, -4] through [0, 4] have been unloaded from the client and there is no way to load them either without reconnecting to the server (this includes the chunk I connected standing in, [0, 0]). F3 overlay shows MultiplayerChunkCache: 81, 36 now.